This is sort of… part 2 of last week’s whipped feta. Oh wait. That was two weeks ago. TWO WEEKS? What is happening? Time is flying before my eyes. Before I know it I’ll have the heat turned up too high with a bowl of Grape Nuts on my lap while Steve Tyrell plays in the background. Errr. Yeah right. Too late for that. This is so simple. So easy. Yet so… satisfying? It’s fun making flavored oil and feels domestic. It tastes complex which makes it feel even more special. It’s like you trick yourself into doing something cool that everyone else in the universe already knows how to do, but you still feel awesome. I have been using this oil on everything. Most notably, on this salad that is making me want to eat salads. I’ve already eaten three this past week, which yes, means that I will probably be sick of it after my fourth considering I don’t know how to pace myself, but let’s relish in the moment, okay? Four salads. Four, people. Probably a record. And obviously, this is the oil that I drizzled over my whipped feta that was layered on the thickest, grainiest toast ever. It’s a miracle I have not slathered it on my face as moisturizer. This is where all of my roasted garlic came from, FYI. It’s like a two-for-one deal, because you not only end up with oil but roasted garlic too! Excellent problem to have. I’m going to try to have this problem every week. Place garlic heats cut-side down in a baking dish and cover with olive oil. Place thyme in oil. Cover with aluminum foil, then place the dish on a baking sheet. Roast for 45 minutes. Using kitchen tongs, remove garlic and place on a paper towel to drain. Pour olive oil through a fine mesh strainer and keep in a seal tight container or jar. It should last about a month. After the garlic has cooled, squeeze the cloves out of each bulb. Keep them whole or mash them with a fork, using as desired. P.S. this also makes your kitchen smell amazing. It’s like garlic oil potpourri. I stumbled upon an olive oil shop in Vegas that sells all kinds of flavored olive oil. They let you sample as many as you want and roasted garlic infused became my favorite, but it’s quite expensive and gets used up fast as it’s great on just about everything, not just salads. Going to try to make my own using your instructions before I spend a small fortune getting my ‘fix’ from them. They also sell an outstanding Balsamic Vinegar that I mix with garlic olive oil for salads. Yum. Recipe sounds lovely but I wouldn’t keep it for longer than a week – botulism starts to grow and reaches levels where it can do serious harm after a week if you infuse fresh ingredients (anything that still contains a water content, like fresh herbs, garlic etc) into oil. Your rosemary oil sounds lovely and should be safe if you use dried herbs. I just made this, but I forgot to place glass dish on a baking sheet! What is the purpose of it and will it still turn out ok? Wow, I have heard this earlier about infusion but never tried it because was not confident about it, but now I am very excited to try this as I have got the exact receipe from your blog post. Rosemary Infused Olive Oil is my favourite actually. It looks very simple and nice recipe. I like your way to roast garlic. I will try this one next week for sure. Thanks for sharing. it is possible to enjoy this recipe safely, but please follow this link so you can be aware of any possible dangers you may be unaware of! I just checked out the link you had stated. And truly thanks a lot for the warning about the risks of botulism with homemade garlic-infused oil ! You can pour it, you can trickle it; you can dribble it, but you cannot drizzle it: olive oil. 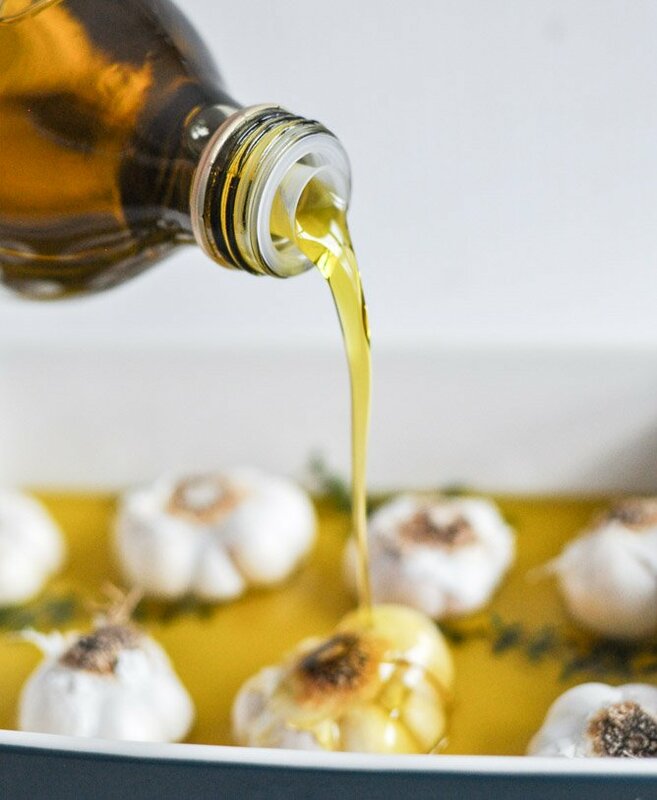 This recipe for roasted garlic oil was super simple which intrigued me to follow your lead and make it. Maybe one or more this thoughts would be useful on your website with the recipe? Keep up the inspiration and e enjoyable writing style.